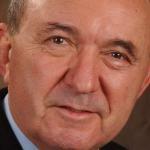 Richard J. Goldstone was a judge in South Africa for 23 years, the last nine as a Justice of the Constitutional Court. Since retiring from the bench he has taught as a visiting professor in a number of United States Law Schools. He is presently a visiting professor at Fordham Law School. From August 1994 to September 1996 he was the chief prosecutor of the United Nations International Criminal Tribunals for the former Yugoslavia and Rwanda. He was a member of the committee, chaired by Paul Volcker, appointed by the Secretary-General of the United Nations to investigate allegations regarding the Iraq Oil for Food Program. In 2009 he led the UN Fact Finding Mission on Gaza. In May 2009, he received the John D. and Catherine T. MacArthur Award for International Justice. He is an honorary member of the Association of Bar of New York and a foreign member of the American Academy of Arts and Sciences. He is an honorary Bencher of the Inner Temple, London and an honorary fellow of St. John’s College, Cambridge.